Synopsis Battle Angel is based on a manga written by Yukito Kishiro called "Battle Angel Alita", which was released in Japan as "Gunnm", and received an anime adaptation of the first few books, called "Battle Angel". The story takes place in the distant future, where cyborgs and robots are common place. A floating city, called Tiphares, holds a dark secret, as it dumps its trash onto the world below. In the junk yard beneath, a cyborg doctor, Ido, scavenges for extra parts when he runs into the head and torso of a young cyborg girl, still alive. Only her brain is human, as the rest of her body is a machine. 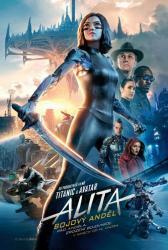 She has lost all her memory of her past, and is given the name Alita by Ido. He rebuilds her, and becomes her surrogate father, as he gives her new body parts. However, as a series of mysterious murders start to spread through the city, Alita starts to suspect Ido in this crimes, as a way to find her body parts. However, she follows him one night, only discover that he has been chasing the real murderer, under the authority given to him as a "Hunter-Warrior". During this encounter with the real murderer, she instinctually acts on her own, taking out the killer with martial arts moves from an ancient school. As a result, she decides to aid Ido in his pursuit of justice, and becomes a Hunter-Warrior as well. As she unlocks her true powers and potential, she encounters deadly enemies, and idealistic friends.The manga contains 9 books, while this movie will only cover the first 3. After the success of the original series, Yukito Kishiro wrote a sequel series, titles "Battle Angel Alita: Last Order". This series is still ongoing, and follows the adventures of Alita as she explores her own past and tries to save her friends.